Debut directors Arnold Buchner and Ivan Engler have clearly bust a gut with this low budget Swiss science fiction film (heralded as the country’s first such genre entry). The problem is, it never stops reminding you of the (usually) better movies that are its inspiration. And it’s not just one movie, the way Trancers is a cheap and cheerful rip on Blade Runner. A steady stream of genre films are evoked during Cargo, as if the makers want to cram it full of homages to their favourite SF ideas and produce a coherent and serious-minded feature in its own right. There are many individually good little ideas in Cargo, but they get swallowed by the over-familiarity of the whole. The cryosleep experience is a suitably nasty, gloopy business that makes Alien’s hypersleep look like a dream ticket. The ship itself is freezing cold all the time, presumably to preserve power. But, while cinematographer Ralph Baetschmann does a great job with the ship, the sets themselves are seriously indebted to the industrial banality of the Nostromo in Alien (and there probably weren’t very many; no doubt they were constantly taken apart, rearranged or simply lit differently). We even see those revolving yellow lights from the xenomorph franchise. Prior to this, the space station and its occupants went for the rundown Blade Runner feel. And before even that, the lush advert for Rhea comes on like the offworld colony adverts in Blade Runner, or a less satirical promo from Total Recall. You’ll need to get used to this, because the movie is derivative of nearly every notable science fiction spectacle of the last 30 years (besides Alien, Blade Runner and Total Recall, the other big name is The Matrix; it even tips its hat to Kubrick and 2010). That might not matter so much if it also possessed the vital spark needed to make it distinctive in its own right. That there are five credited writers probably didn't help matters; perhaps each was pressing to shoehorn in their top SF film. Aided by Baetschmann, the directors ensure their spaceship feels vast and that it drips with drips and atmosphere; the prowling camera and very gradual pull-ins show a directorial duo that has studied the Alien movies all their lives. During the early passages of the film, this solidity ensures that the less than stellar CGI just about carries; much of it is attempting to service the physical spectacle, so the shortcomings are rather more forgivable. Later on, even the most charitable will in the world can’t fail to be aware of visuals the makers of Babylon 5 would have rejected by 15 years ago. It’s this grounding that ensures the first half of the film is significantly superior to what follows. Deposited in a claustrophobic environment, you don't quite know where it's all leading. The use of verbatim sound effects from Aliens ensures one half-expects a monster to slaver out of the darkness towards our heroine (Ripley, anyone?) While it’s just as well they don’t go this route, the actual reveal is still faintly underwhelming (it’s been telegraphed by a news broadcast in the first five minutes anyway). I won’t spoil what transpires, but the type of plot device seen here has been used so frequently that it’s lost all claim to signalling brainy storytelling. Which is particularly acute in this case, as the protagonists' plan to resolve the situation fails to stand up under the most cursory scrutiny. Hey, They Live! has a more convincing denouement (it also had its tongue firmly in its cheek, which takes the edge off such concerns). 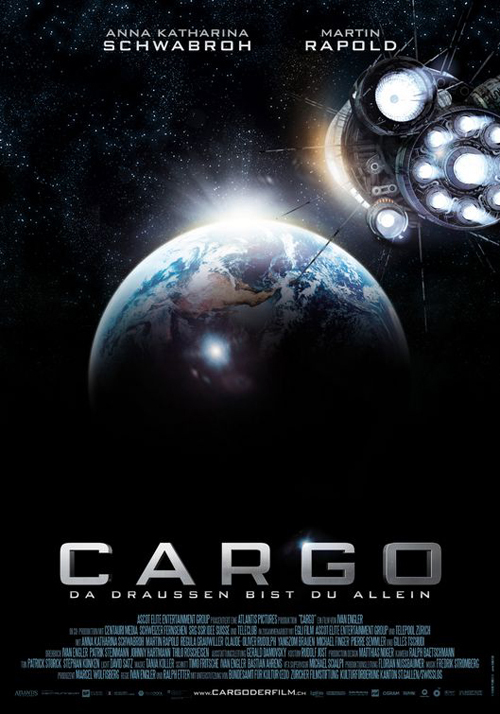 Cargo ends up both rushed and not terribly exciting. Everyone's attempting a big finale, but it stutters under the limitations of bargain basement effects and a formulaic script. While there are strong performances all round, it’s very evident that characterisation-wise the writers never got past the blue-collar Alien vibe. Still, the direction and cinematography show huge promise; hopefully these guys will get a crack at something bigger, better and a bit more original in the future.